This one of the rare times where I tried a product without any prior knowledge of its ingredients or nutritional information. These chocolate balls were sitting on display (openly without packaging) in Ikea’s cafeteria, and I couldn’t help myself from tasting one. I was very delighted by this unique confection and have made a habit of having one every time I visit this wonderland of furniture stores. I’ll set the tone for this review with an an excerpt of marketing material I received from Ikea. The first time I picked up these chilled chocolate balls I was surprised at its weight, hinting at the massive amount of delicious things packed inside. There is a strong sweetness and rich chocolate flavor, but the complex texture of this product is what really makes it so special. I struggle to find a way to describe its hearty composition. It’s almost like someone dug deep into the earth and pulled out a crumbly chunk of slightly oily, chocolaty soil, When you chew through the middle of the ball there is sort a gritty sensation which is a treat for the jaw, somewhere between crunchy and chewy. There’s also a strong chocolate scent to complete the taste experience. At the time I had no idea how they crafted this magnificent texture, but when I read through the ingredients later I discovered that oats where the main contributor, with help from wheat flour, egg powder and baking soda. Irrespective of the nutritional value of this product, I consider this a masterpiece of cookie design. If you take big bites you’ll polish off one of these in no time. Try to nibble small morsels one at a time for maximum enjoyment. The coconut sprinkled on the outside of the ball added little to the taste or texture. I even broke off a piece of the crumbly inside, without the outer layer of chocolate coating and coconut rasp, but it tasted the same. To be fair, without the coconut sprinkles I think the appearance of the product would be naked and bland. If nothing else it hints at the texture inside. The only thing preventing me from giving this a perfect flavor score is that the taste is so rich, its difficult to enjoy more than one in a sitting. It does go perfect with milk, however. Each ball weighs in at 40 grams and packs 195 calories. For a small desert that’s quite a punch, but the calories/weight ratio is comparable to other similar candies. Take Ferrero Rocher’s Hazlenut chocolates where one serving (three balls) contain 220 calories for 41 grams. There are 13 grams of sugar which is reasonable for this type of product (compare to 15 grams in the same Hazlenut chocolates). Regardless of these figures, If I was trying to cut down on calories and sugar, I would pick Rocher’s product because the smaller ball size, with less density of ingredients, means I can spend more time enjoying them. There isn’t much nutrition here, with only 2 grams of fiber and protein, and practically no vitamins or minerals. That’s OK with me, since I don’t expect much nutrition for a dessert of this type. Oat flakes (27 %), margarine (vegetable oils, water, salt, emulsifier [E471], natural flavouring, antioxidant [E330]), sugar, chocolate flavoured coating (12 %) (sugar, vegetable oil, fat reduced cocoa powder [15 %], emulsifier [soya lecithin], stabilizer [E492]), crumbs (sugar, oats [25 %], margarine [vegetable oils, water, salt, emulsifier (E471), antioxidant (E330), natural flavouring], wheat flour, egg powder, raising agents ­[E500ii, E450i, E503ii]), inverted sugar syrup, coconut rasp (2.5 %), fat reduced cocoa powder (1.6 %), flavouring, colour (E150a), water, preservative (E202). May contain traces of milk and almonds. Its nice that 27 % of this product is oat flakes. Unfortunately there are several ingredients I try to avoid – margarine, flavoring (one is ‘natural’ while the other is likely artificial), an antioxidant (citric acid), preservative (potassium sorbate) and coloring (caramel color, class I – the least risky of the four classes). With practically no nutrients and a handful of potentially harmful ingredients, this product should never be eaten for the purpose of nourishing the body. 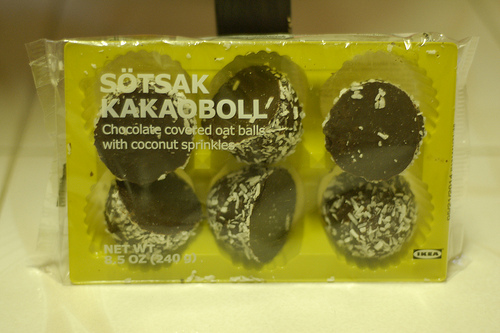 These chocolate balls are sold in Ikea stores as singles (for roughly $1.00 each) and in packs of six for $2.29. 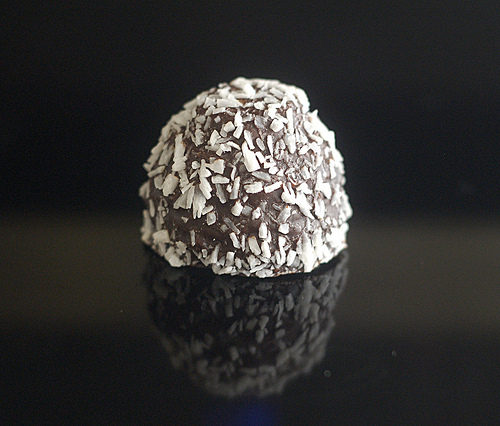 I am considering making a homemade version of these chocolate balls myself someday, so I was very delighted to find that Ikea has a free handout available which contains a recipe for this product. Surely it will not taste exactly the same, but it has less ingredients and will likely be much healthier. This is probably the first time I’ve seen a store do this (except for places like Publix which stand to make a profit from ingredient sales) and I’m very impressed Ikea went out of their way to do this. A delicious, unique desert which should be sampled once by any sweet tooth. Be careful about getting addicted since it lacks nutrition and contains several suspicious substances.